Established in 1859 as the International Bowling Saloon and re-built in its present architectural form in 1902, The Buffalo Room is the site of the oldest bar in the state of Colorado. The recent remodel fully restored the classic masonry façade, re-exposed and highlighted the original interior brick walls, and revealed many distinct architectural elements that have characterized this wonderful building since the early 20th century. The Buffalo Room is available for private dining and is ideal for corporate or larger social dining functions with seating for up to 75 guests. Please note: 1. Buffalo Rose site rental fees vary based on: a) the date of the event; b) the total facility access time; c) guest counts; and d) equipment and services to be provided by The Buffalo Rose for the event. 2. For social events (non-weddings), pricing for the event venue can be set for either 7 or 10 total hours of facility access. 3. Seven-hour facility access times can be set for the following time blocks: 9:00am-4:00pm, 3:00pm-10:00pm or 5:00pm-midnight. Time block will be adapted for 10-hour access. All events must end by midnight Mountain Time. 4. Facility access time for weddings is always set for 10 hours. We recommend 2:00pm-midnight for scheduling purposes. 5. June, July, August, September, and December are considered “High Season” and will be priced at the higher end of the range. Site rental fees for all other months will generally be at the lower-end of the range. 6. Site rental pricing includes tables, chairs, linens, china, flatware, glassware, Buffalo Rose staff set-up, tear-down and post-event cleaning of the room. 7. As available, The Lobby, State Room, Buffalo Room, Barbershop and Back Deck can be reserved for up to 3 hours. 8. All private spaces require a minimum Food & Beverage purchase commitment based on the event type, the event date and the final Food & Beverage plan and guest count. The State Room is located on the mezzanine level of The Buffalo Rose event venue directly above Washington Ave. With nearly 1000 square feet of steampunk elegance, The State Room has a private bar with its own highly curated drink program, views over Washington Ave. out to Lookout Mountain, private bathrooms, an elegant fireplace, and two large TV screens for watching the live event happening on the venue stage below or to enjoy televised sporting events. Guests can access The State Room through a dedicated entrance on Washington Ave. or through The Rose main venue space. The room is set-up with lounge and bar seating or it can be converted into a private dining space. Giant sliding glass doors open up on to the venue mezzanine, allowing guests to freely move from their private VIP suite out into the venue viewing area to enjoy a live event. This one of a kind room is ideal for private corporate gatherings, concert VIP ticket upgrades, food and beverage tastings, private dinners, graduation parties, meetings, smaller receptions, and championship game viewing. The State Room seats up to 30 guests or as a reception space for up to 50 guests. Built in 1922 and converted into an elegant indoor pool in 1928 called the “Golden Plunge”, "The Rose" main venue and lobby offer roughly 6500 square feet of bygone-era art deco glamour. Visitors enter under the classic grand marquee on Washington Ave. and are immediately transported back in time to the great western American theaters of the early 20th century. The Lobby features lounge-style seating, classic parlor games, and four big-screen television. Guests pass by a fully stocked bar as they enter into the main venue space with soaring ceilings, bold steel trusses, elegant lighting and original brick walls. The Rose also features a concert-quality sound system, a large video projection system, a full-sized dance floor and an elevated stage enabling comprehensive entertainment options. The Lobby provides reception space for up to 100 guests whereas The Rose main venue can accommodate up to 200 with seated dining, 250 theater-style seating or reception space for up to 450 guests. The two spaces together are ideal for concerts and other live entertainment, large corporate events such as keynote addresses, award presentations, charity galas, class reunions, bar/bat mitzvahs, holiday parties, dinner theater, alumni gatherings, award banquets, family reunions, receptions, and many other types of gatherings. Rental of the entire event venue offers nearly 10,000 square feet of space and includes The Rose main venue and lobby, the 2nd-floor State Room and mezzanine, backstage bride's room and greenroom / groom's suite. The entire event venue can accommodate up to as many as 800 guests. Minimum Food and Beverage purchase required to reserve this room. Please contact our Special Event office for more information and to tell us about your event. The Buffalo Rose has long had an energetic outdoor patio along 12th St. The Buffalo Rose patio remains in its original location, but is now directly connected to a new Buffalo Rose bar by way of a large glass door opening. The private patio section that we refer to as "The Back Deck” seats up to 25 guests. Book The Back Deck and you and your friends will enjoy a cocktail party with live patio music in a comfortable outdoor setting. The area has two fire pits and is under a roof to shelter your party from the crazy Colorado elements. Minimum Food and Beverage purchase required to reserve this room. Please contact our Special Event office for more information and to tell us about your event. A true piece of American West history in the heart of downtown Golden, this building was originally called the “Iler Block” and now serves as the entry area for the reconfigured Buffalo Rose bar and restaurant. This classic old west structure was built in 1871 and operated as the Sportsman Barbershop for over a century from 1901-2017. The building is located at the corner of Washington Ave. and 12th St. and was completely restored as part of the recent remodel project. The Barbershop features one of the only exposed brick nogged walls still standing in the entire world! The space also features an original vaulted ceiling, handsome interior wood siding preserved from the Civil War era, and cozy lounge seating arrayed thoughtfully around a beautiful steel and brick fireplace. The room opens conveniently out on to a patio along 12th Ave. The room seats up to 15 guests and is perfect for a ladies’ night out or to use as a home base for your group to enjoy the Holiday Candlelight Walk and other exciting downtown Golden activities. The Buffalo Rose is an iconic downtown Golden property. 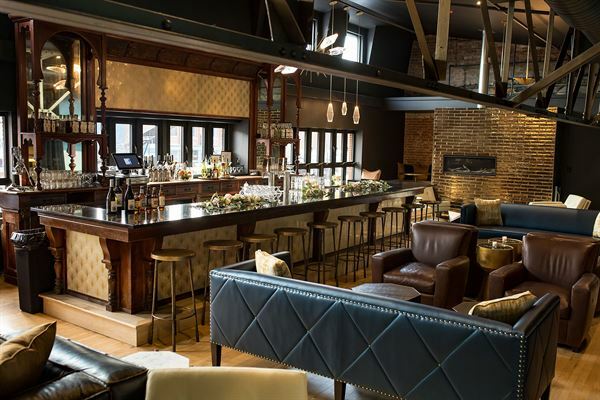 With almost 10,000 square feet of rentable space, the operation features several interconnected indoor and outdoor options for private events, making it the ideal venue for parties ranging from as few as 10 to as many as 800 guests. Rental of the entire event venue includes The Rose main venue and lobby, the 2nd-floor State Room and mezzanine, backstage bride's room and greenroom / groom's suite. The entire event venue can accommodate up to as many as 600 guests. Atmosphere/Decor: Completely remodeled venue featuring soaring ceilings, bold steel trusses, elegant lighting and original brick walls. Throughout the venue you will come across art deco, steampunk elegance, and restored classic masonry façades. Special Features: Our all-inclusive venue comes equipped with tables, chairs, linens, china, flatware, and glassware. We also provide full in-house catering, beverage service, and staffing. Atmosphere/Decor: Western theater art deco with soaring ceilings, bold steel trusses, elegant lighting and original brick walls. Atmosphere/Decor: A steampunk lounge with a historic bar overlooking downtown Golden. Special Features: Private bar and bathrooms. A highly curated beverage program. Can be fully private or open up into The Rose main event space. Atmosphere/Decor: Rustic Western American. Originally built in 1902 and fully refurbished in 2018. Special Features: Indoor and outdoor seating. A true piece of American West history in the heart of downtown Golden, this building was originally called the “Iler Block” and now serves as the entry area for the reconfigured Buffalo Rose bar and restaurant. This classic old west structure was built in 1871 and operated as the Sportsman Barbershop for over a century from 1901-2017. The building is located at the corner of Washington Ave. and 12th St. and was completely restored as part of the recent remodel project. The Barbershop features one of the only exposed brick nogged walls still standing in the entire world! The space also features an original vaulted ceiling, handsome interior wood siding preserved from the Civil War era, and cozy lounge seating arrayed thoughtfully around a beautiful steel and brick fireplace. The room opens conveniently out on to a patio along 12th Ave. The room seats up to 15 guests and is perfect for a ladies’ night out or to use as a home base for your group to enjoy the Holiday Candlelight Walk and other exciting downtown Golden activities. Atmosphere/Decor: Special 1800s western ambience. Special Features: Great fireplace and indoor seating (15 seats) + outdoor (15 seats). The Buffalo Rose has long had an energetic outdoor patio along 12th St. The Buffalo Rose patio remains in its original location, but is now directly connected to a new Buffalo Rose bar by way of a large glass door opening. The private patio section that we refer to as "The Back Deck” seats up to 25 guests. Book The Back Deck and you and your friends will enjoy a cocktail party with live patio music in a comfortable outdoor setting. The area has two fire pits and is under a roof to shelter your party from the crazy Colorado elements. Atmosphere/Decor: Great covered outdoor space with 2 fire pits and comfortable seating. Special Features: Outdoor stage for live music. Special Features: The venue has 6 event spaces: 1) "The Rose" main event space; 2) The main level venue lobby; 3) The State Room (2nd-floor VIP lounge); 4) The Buffalo Room; 5) The Barbershop and 6) The Back Deck.